Vienna is one incredible city - the culture, the architecture and the general vibe of the city are all so endearing. The food is pretty great too! I've heard a lot about the fine dining in Vienna, but to be honest, it's not always what's on the menu for me when I travel. I love a fancy night out at a restaurant as much as anyone, but I also love steering clear of overly anticipated eateries when I travel in favour of more local, quirky and/or budget-friendly spots over the standard Michelin Star vibe where I can enjoy something deliciously casual. While in Vienna I ate lots of drool-worthy food whether it was a traditional Viennese sausage from a street food vendor, an indulgent sweet treat from one of the city's famed cafes or a plated meal, but these three were my favourites for a number of reasons. Let's start with the most important meal of the day, shall we? Our trip to Vienna was one that I researched more than others I've taken in the past and of course I started with food. I couldn't help but be tempted by many of the Vienna restaurants I found when I searched on Google, many of which we didn't have time to dine in, but we visited anyway for dessert or a drink at the bar. One of the most unique restaurants I found online was Spelunke, a fun and edgy spot that serves food and drinks all day. While we ate breakfast most of the time at our hotel, we ventured out for the first meal of the day one morning at Spelunke. Spelunke is one of the more popular restaurants in Vienna and I can certainly see why. 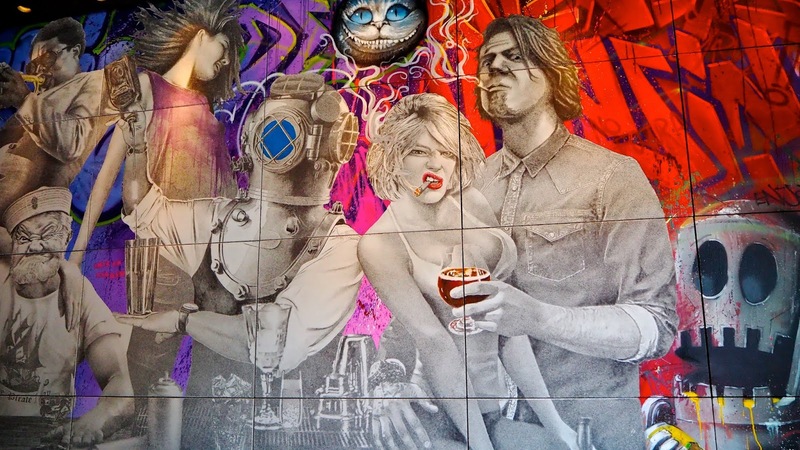 With a rock-n-roll vibe, colourful murals on the walls and some of the coolest decor I've ever seen, I must admit that part of what drew me to it was its unique look and I can imagine I'm not the only one. The menu is enticing as well and if that's not what you're after, the pastries on display are more tempting than you can imagine. If the weather is nice, it's great to sit outside which is what we did, but if it's chilly you won't feel cheated with a seat inside among all the fascinating wall art, album covers hanging on the walls, the exposed copper of the bar area and some rather intricate light fixtures that will definitely catch your eye. Even if you don't have to go, be sure to visit what can only be described as the coolest loo I've ever been in. You'll need to push the button on the floor with your foot to open the graphiti covered glass doors which will reveal stall doors that look a bit like submarines and there's even a hairdryer, which is perhaps for those who've been caught in the rain. I'm not the biggest breakfast eater, so I opted for "A Small Bite" which is a very affordable €5.50 and includes a croissant and a cup of coffee. The coffee was so good I stayed for a second cup and the pastry was delightful. Of course if you want something heartier they do offer that, but there are a few healthy options too including things like chia pudding, quinoa and granola. Whatever you choose, I'm sure you'll enjoy it, especially with such unique surroundings. For more information, to see the menu, directions and reservations, click here to visit the Spelunke website. Lunch can be tricky when you're on a city break because you want something delicious, a comfortable place to sit while you rest your feet from the sightseeing and you don't want to veer too far from your planned path for the day. When I'm having a day of sightseeing, I love Italian food for lunch. A little carb-loading is just what I need to fill up, refuel and keep energy levels high while I'm exploring from street to street. While wondering around the city centre of Vienna, we stumbled upon Ristorante Firenze Enoteca and it looked perfect. Serving up traditional Tuscan food alongside Italian wines, this little gem stole my heart. The service is impeccable, there's both indoor and outdoor seating and the price is right. Choosing between pizza, pasta and the other items on the menu provides a bit of a challenge, but in the end my husband and I opted for two different pasta dishes we could share. 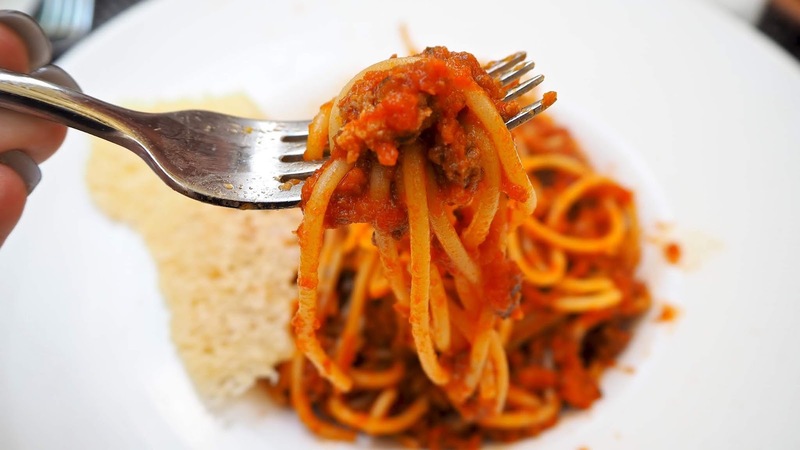 The Spaghetti Bolognese with its traditional meat sauce and the Spaghetti Aglio e Olio con Peperoncino with its rich, spicy, garlicky flavours were both perfect. My favourite part of these dishes is that they were both deliciously garnished with a Parmesan crisp. The pastas were perfectly cooked and the flavours memorable. I know we'll go back to Vienna some day and this restaurant will be at the top of our list of things to do when we get there. 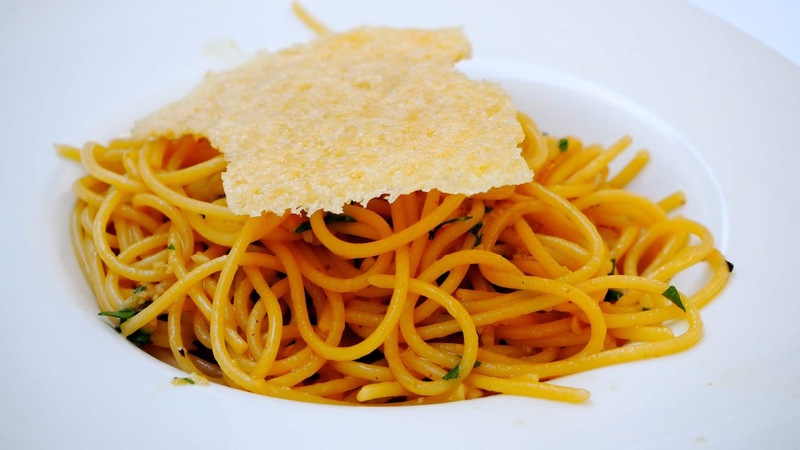 I could eat these pasta dishes every day - they're that good and just steps away from many of the attractions you'll want to visit if you're planning a trip to Vienna. Click here for more information, menus and reservations. In addition to my own research, one of my husband's Austrian colleagues was kind enough to weed through the noise and give us some recommendations. She suggested we try Café Schwartzenberg, so we had dinner there our first night in town since it was reasonably close to our hotel. 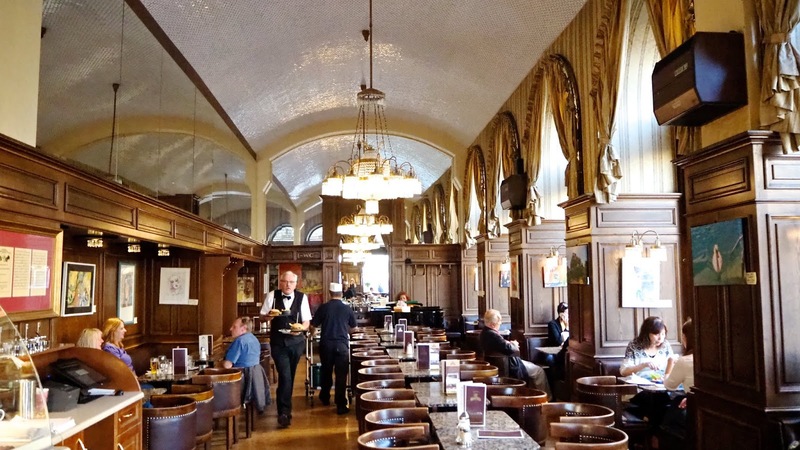 A traditional Viennese coffee house, this beautiful Ringstraße café has a lot of history. 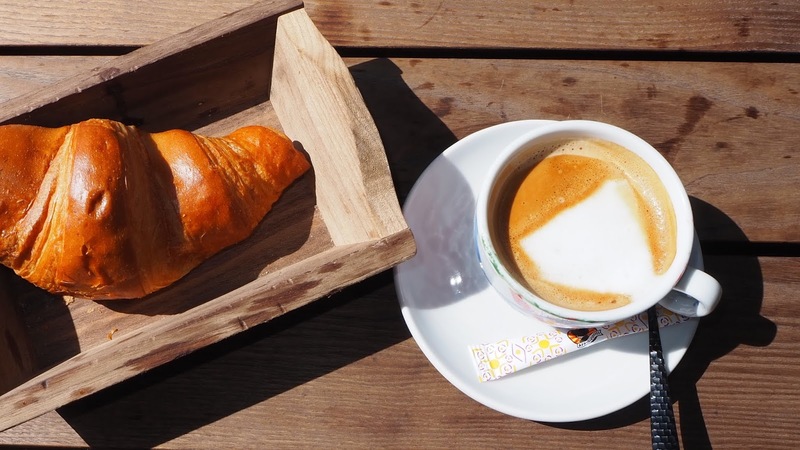 Coffee houses started popping up in the Vienna back in the 17th century when they became popular meeting places for city dwellers, however people haven't always visited them specifically for a cuppa Joe, but rather for inspiration, socialising and recreation. Similar to pubs here in the UK (a word that has been shortened from Public House), coffee houses became a sort of second home for many where they could read, play games, meet friends, have a nightcap, dine or even hold business meetings. Formerly known as Café Hochleitner, Café Sperrer and Café Deutschland during WWII, Café Schwartzenberg got its current name during the early 20th Century and it was fully renovated and modernised in 1979. During WWII it was used as a space for the Soviet Red Army, during which time much of the decor was destroyed or damaged by gunfire, but a few older parts of the interiors have been salvaged and you can read more about that by clicking here. Famous patrons of Café Schwartzenberg were architect Josef Hoffmann, painter Hermann Nitsch and actress Adrienne Gessner. At one time there were more than 30 cafés along the Ringstraße, however Café Schwarzenberg is the last one standing and a perfect example of Viennese café culture where you can enjoy a deliciously traditional dinner. Like many coffee houses in Vienna, Café Schwartzenberg offers both indoor and outdoor seating and resembles a sit-down restaurant or brasserie more than a coffee shop. The menu is extensive as is the drinks and wine list and you can indulge in a rather impressive selection of pastries, cakes and other sweet treats should that be what you fancy. 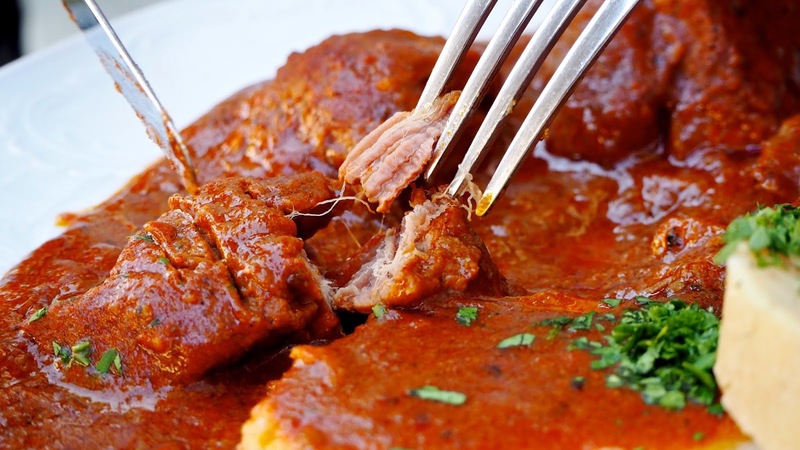 The menu features a wide selection of traditional Austrian and Austro-Hungarian fare including dishes like Goulash and Wiener Schnitzel, which is exactly what we ordered. 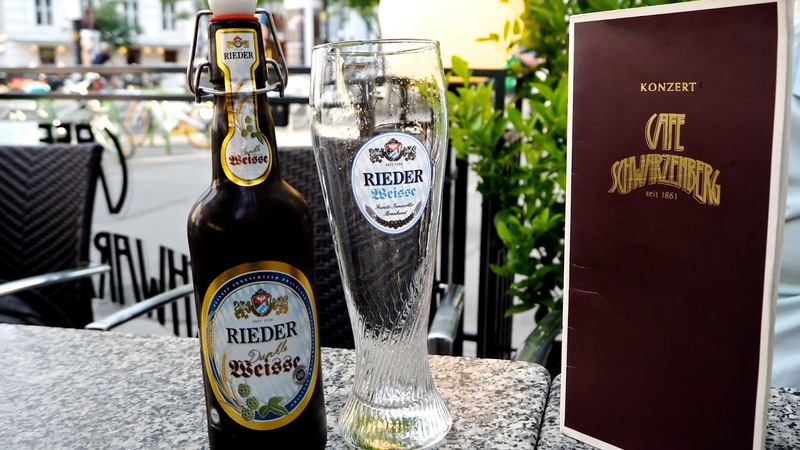 If you're eager to try a local beer, you can do that at Café Schwartzenberg however the wines on offer are very nice too. Our first meal in Vienna was delicious, memorable and was served complete with a beautiful view of the Ringstraße. The crowd is varied in age ranging from young and hip to the very old and people are seated for everything from full-blown 3 course meals or only coffees, so anything goes. 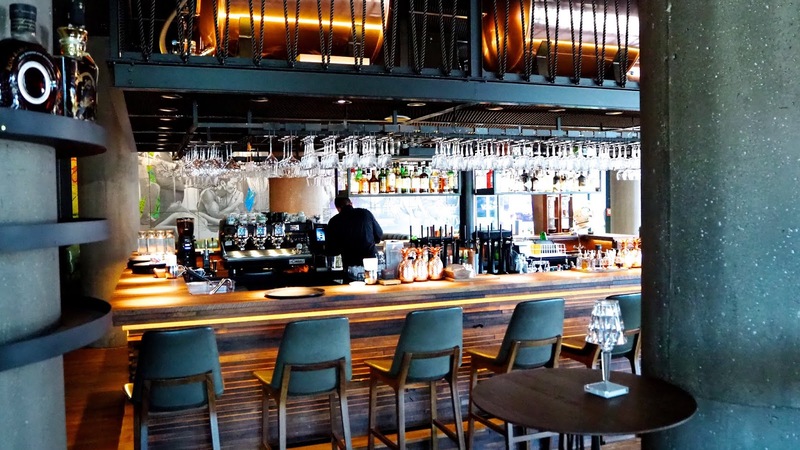 The service is very good and it's not difficult to spend a few hours there, soaking in the views and enjoying as much of the menu as you have room for. 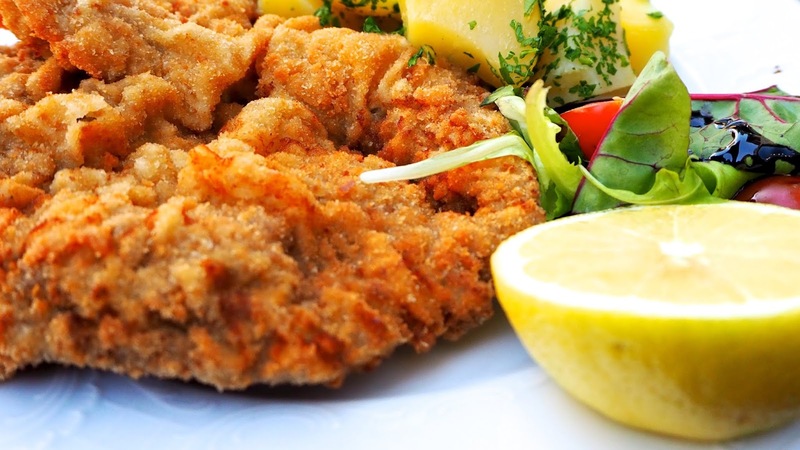 Traditional food is served all over Vienna, so it's not difficult to get your hands on a schnitzel or a strudel, however I will say that not all the eateries are equal in quality. 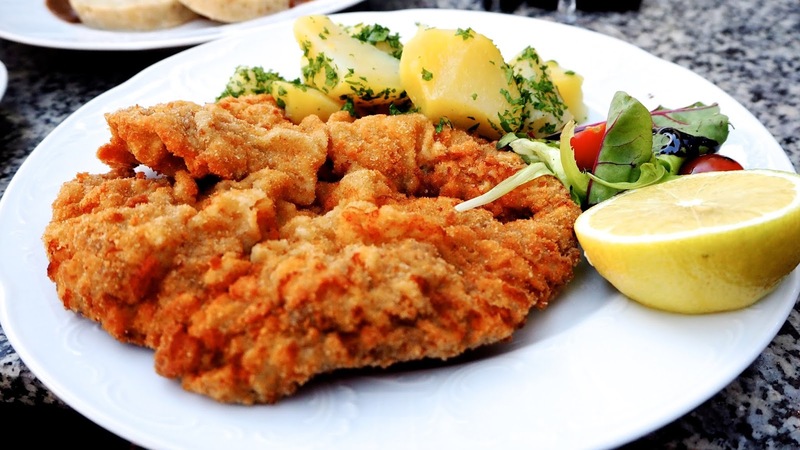 If it's your goal to try Wiener Schnitzel (basically a thin steak of veal, breaded and fried) while visiting Vienna, I can certainly say you'll get a good one at Café Schwartzenberg. 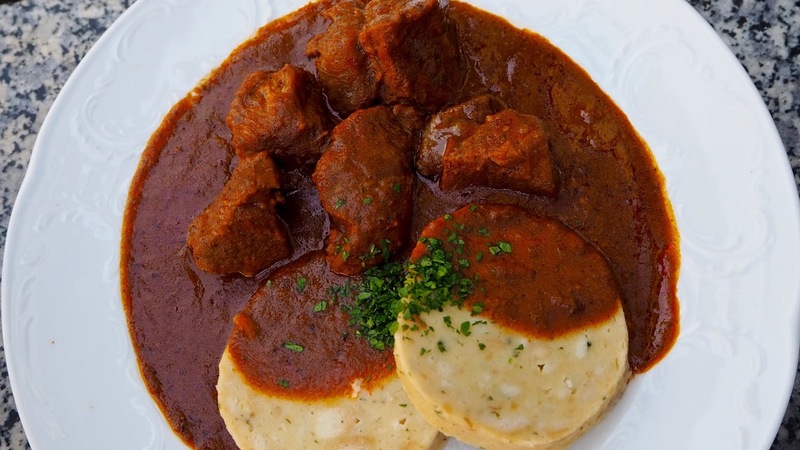 The Goulash is incredible too and also worth trying! Café Schwartzenberg is about a 20 minute walk from The Belvedere, so if that's on your list it's a great idea to visit them on the same day. For more information, to see a menu or to book a reservation, click here to visit the Café Schwartzenberg website. 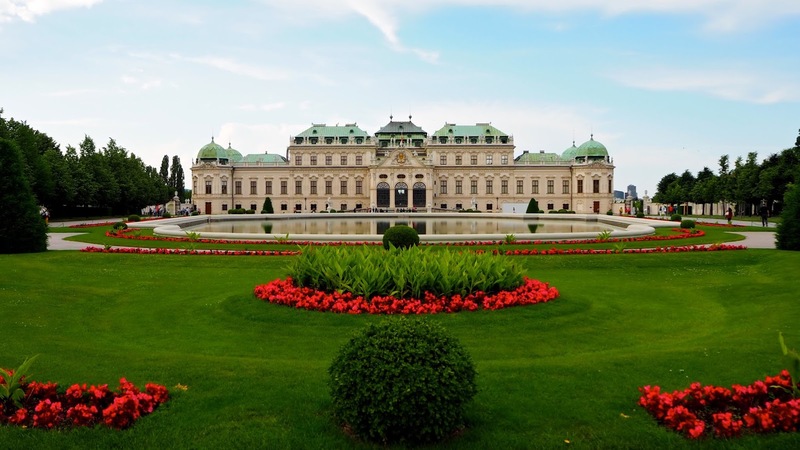 Click here for more posts about Vienna.